I stopped at a small town antique store on my travels during vacation this week to see if they had anything interesting in the way of old tools. I saw a Stanley “Bailey” #3 smoothing plane. It was in mint condition, it looked unused and shiny as if it was kept in grease and just toweled off to view. I knew since it said Bailey on the front it was the older premium line back in the 40-60’s but there was no tarnish to the metal at all. I had to double check using my phone. I was right, 1948-1961 type 19. I asked the lady if she would go lower than $85, she said she would sell it for $65 but had to double check it’s box. She even had the 60-70 year old box for it. She said a man brought it over from England to sell it to her, it even had the price tag still on it in British pounds. •The frog receiver, in the bottom casting, now is y-shaped. •Rosewood is re-introduced, and is often varnished so heavily that it almost obscures the grain. 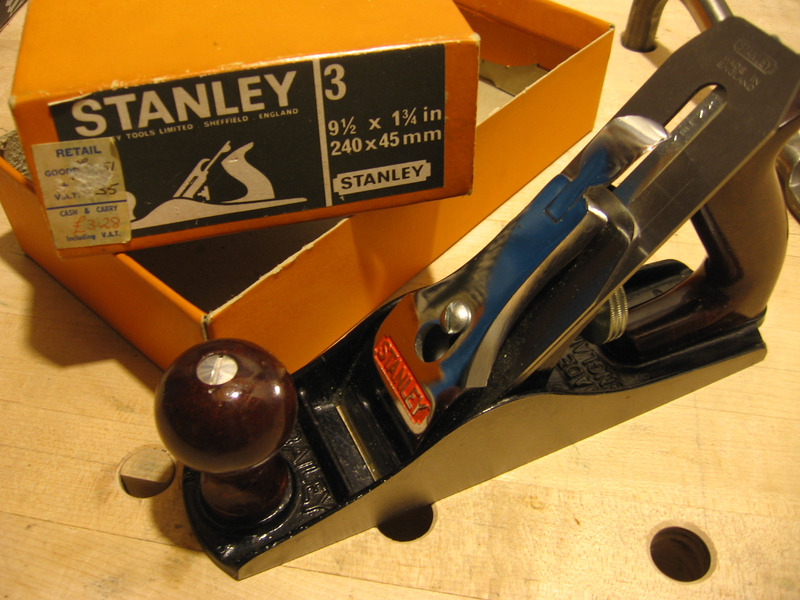 •”STANLEY” is now incised in a vertical direction on the lateral adjustment lever. •The original type study doesn’t mention this, but on some of the models of this type “STANLEY” is stamped on both sides of the lateral adjustment lever. I’ve seen enough of these to convince me that’s it wasn’t accidental, or if it was, it was a big screw-up. •The knurling on the brass depth adjuster is now parallel on most examples. •Later examples have the familiar black paint on the hardwood tote and knob. •Type study doesn’t mention this, but the cutters now have rounded tops instead of the angular top. This change happened in the mid–1950’s, in my opinion. •Furthermore, the original type study doesn’t mention the change in the finish applied on the forked lever. For a short while, some models had a nickel plated appearance on them as a finish rather than the usual black japanning. Where in the sequence of actual manufacturing this subtle change fits is unknown to me, but I’ve only noticed it on those planes equipped with rosewood knobs and totes and rounded irons. This entry was posted by admin on Sunday, July 12th, 2015 at 11:41 pm	and is filed under Uncategorized. You can follow any responses to this entry through the RSS 2.0 feed. You can skip to the end and leave a response. Pinging is currently not allowed.